The heat in India is becoming extreme. In fact, most travelers have been migrating slowly from the south on up to the north. Like seasonal birds, we began our journey in Kerala and Tamil Nadu where even in the winter the heat is intense, but feasible. Slowly the heat pushed us northward to the beaches of Gokarna and Goa. Travelers then take a few different routes northward, but eventually everyone ends up in Dharamsala, the Buddhist village in northern India’s Himalayan mountains. The climate here is just about perfect– beautiful days of summer sunshine, brisk mornings and nights of fresh mountain chill. It’s been seven months now since I left home. I’m at the point in my travels in which I’m very much excited to visualize homecoming and smile to think of all the people I will soon get to hug and reconnect with. But now that I only have 40 days left in India there is some urgency to make the most of my days and enjoy this gift as much as possible. The point being: I’m excited to be going home, but I don’t want that day to arrive too quickly. My travels have slowed down significantly past three months. In the beginning I was hopping around every few days to a different town and would get a bit anxious if I stayed anywhere for too long. Now it’s all about slowing down the time and enjoying the moments. Staying in Rishikesh for a month and half was a gift, taking refuge in days of leisure, yoga, meditation, inspirational teachings and frequent dips in the icy cold Ganga River. But eventually the heat there, too, got too extreme and I had to move onwards to the mountains. I wasn’t planning on spending this long in Dharamsala but it’s hard to find a reason to leave. 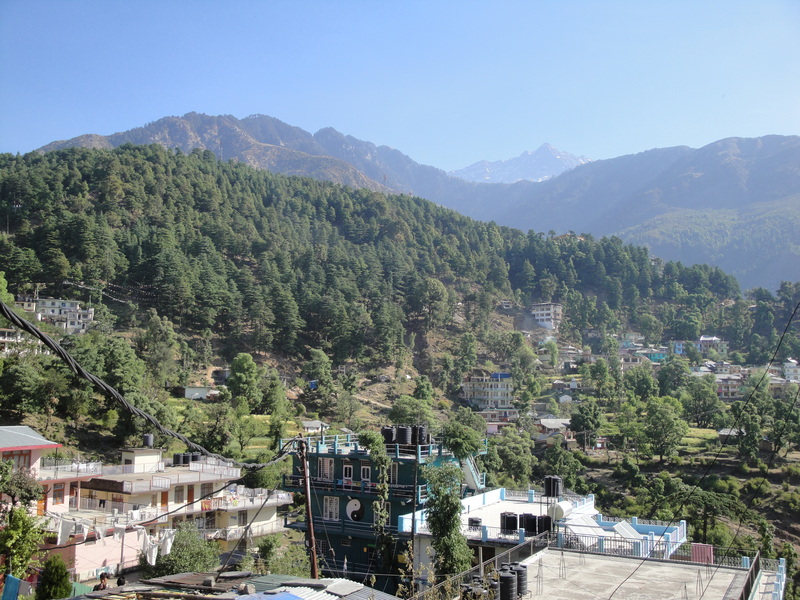 Of all the India places I’ve visited, Dharamsala is by far the most traveler-friendly. The air is fresh, mountains are green, countless delicious restaurants serve nice Indian, Tibetan, and international cuisine. And after months of drinking nothing but Nescafe mixed with hot milk, the discovery of great coffee shops serving delicious coffee has made me immensely happy. The vibe here is super kicked back and fun. There is the Tibetan part of town where Dalai Lama, many red robed monks and the Tibetan folk live. That’s the cultural part of town and there’s a big fascinating temple where monks sit around debating Buddhist philosophy and praying. The other two hotspots of this area are not much Indian, and have little culture per se. They are more just traveler enclaves where throngs of dreadlocked travelers from Israel and everywhere hang out all day and all of the night, socializing, partying, strumming guitars, and exchanging ideas. They are an extremely diverse, fun, beautiful population that walk around barefoot and smile a lot. After a few weeks of living here we’ve all become a curiously-close family of friends. In fact, you can’t go anywhere without bumping into friends and then you can’t help but stopping for a cup of chai and some fun conversation. Many spend all of their days doing little else but hanging out in restaurants rolling charras cigarettes, but there’s also many opportunities for learning and self-improvement. Yoga, Reiki, Tai Chi, meditation, massage, philosophy, silver-smithing, music lessons, dance…you name it, whatever your interest is there’s a class here for you. My days have been quite busy as I’ve been doing some volunteer work as well as studying tabla, Swedish massage and Reiki, which is the spiritual practice of healing by laying of hands and channeling divine energy. The massage classes were excellent and I learned lots. Since then I’ve been giving many massages in hopes of solidifying the things I’ve learned. Something magical happens while giving massage. For a long time now I’ve believed strongly in the healing power of touch, and I think that as a species we are much too shy with our affection, that we try to minimize human contact. Not surprisingly, many of us are also unable to love, and lack the ability to be compassionate, understanding, and kind to our fellow humans. Massage feels nice and can heal aches and pains. But for me, I’m most intrigued by its ability to restore peaceful, loving mind. When I give massages I close my eyes and I focus on this person in need, whose heart needs unconditional love and acceptance. With a prayer and a wish for happiness, I massage as lovingly as I can and just try to please this person. Patients come to me as strangers, but after giving them a massage I feel this profound warmth and connection. After 2 hours of projecting energy and touching them I feel able to love unconditionally, accepting them for who exactly who they are. My patients all tell me I give great massages, which makes me happy to hear. It’s proof of the old saying, “the heart that gives gathers”. In two days I begin a ten-day silent retreat in the mountains. The retreat is an Introduction to Buddhism with emphasis on meditation, philosophy, and yoga. I can’t wait! I feel like these are my last two days on earth, to live the earthly life of desires and wordly pleasures before retreating into austerity and silence. The retreat center is a beautiful compound situated in a peaceful Himalayan forest where many monkeys are hopping around from tree to tree. After several weeks of this busy social life I’ve been living, I’m really looking forward to being silent for a while. Yeah! Another post from Kieran! Thanks for the vivid imagery and sincere post. Sounds like you're doing everything right over there. Homey's happy for homey. Peace and good coffee. All the best on your retreat, and we'll look forward to seeing you in Oregon.